Pixelache | Open lecture by Erkki Huhtamo at KUVA 23.11. News : Open lecture by Erkki Huhtamo at KUVA 23.11. 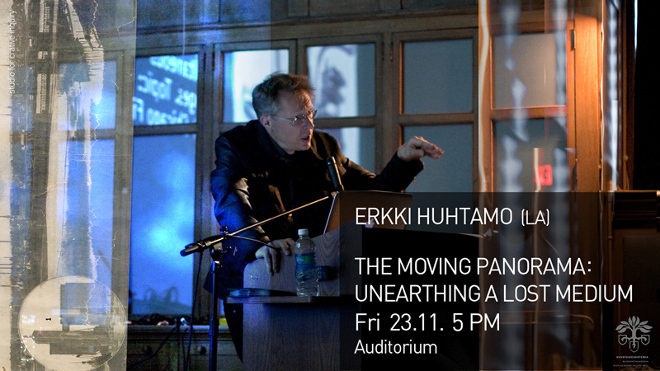 Media archaeologist, theorist and curator Erkki Huhtamo will deliver a lecture on one of the oldest cinematic spectacles, entitled 'The Moving Panorama: Unearthing a lost medium' at the Finnish Academy of Fine Art on Friday 23rd November from 17-19. Professor Erkki Huhtamo is well known as a media archaeologist - in fact one of the key theorists coining this very term. He is also an exhibition curator (he has curated large-scale exhibitions such as "Alien Intelligence" at Kiasma, 2000). He teaches media history and theory at the UCLA Department of Design & Media Arts in LA, California. Huhtamo has written extensively on media archaeology -- an emerging critical approach he has developed since the early 1990′s along with Jussi Parikka, Siegfried Zielinsky, and others -- as well as the media arts. The lecture is open to all, welcome! Media archaeology excavates forgotten, neglected and suppressed media-cultural phenomena, helping us to penetrate beyond canonized accounts about media culture. Huhtamo pays particular attention to the “life” of topoi, or clichéd elements that emerge over and over again in media history and provide “molds” for experiences. What may seem new often proves to be just new packaging of ideas repeated during hundreds and even thousands of years. In recent years, Huhtamo has applied this approach to phenomena like peep media, the notion of the screen, games and mobile media. He has also written about the ways in which media artists like Paul deMarinis, Rafael Lozano-Hemmer and Bernie Lubell have integrated media-archaeological elements into their work. Huhtamo’s most recent books are Media Archaeology: Approaches, Applications, and Implications (co-edited with Jussi Parikka, University of California Press, 2011) and a forthcoming monograph titled Illusions in Motion: a Media Archaeology of the Moving Panorama and Related Spectacles.